Some months ago I woke up and decided to make a pilgrimage to Floret Farm. I asked Erin if I could come and spend some time with her. We'd emailed a handful of times, and lately I am trying harder to close the gap that the internet forces on us. Also - I'm not gonna lie, I wanted to get in on some of her flower farm mojo. If you've followed Erin's blog, you know how special Floret is, so I'm not going to great lengths to describe it. You know the flowers are beyond. Fairy tale material. Eric and I got a personal extensive tour of Jasper and Elora's insect collection. The whole experience feels like a long dream. It's been hard for me to put into words in the week since I've been back. Magic is a strange thing to talk about. Is there real magic at floret? No. There's a lot of hard labor, and a lot of conciencious growing practices. Serious respect for the soil. Ridiculously healthy crops. Most impressive to me though is this indescribable, fantastic energy...the "let's do this!" or the "ok! all hands on deck, we're going to make this work right now" that I have aspired to in my own business. In the last few hours of my visit Erin and I talked a lot about specific practices; and her use of compost tea. She kept joking about the magic "juju" that results when she gives her plants the tea. At our studio we use the word ju (or jeuge) to describe the last touch... the je ne sais quoi you give an arrangement right at the end. But how different to experience the arrangement before it's conception; in the field! 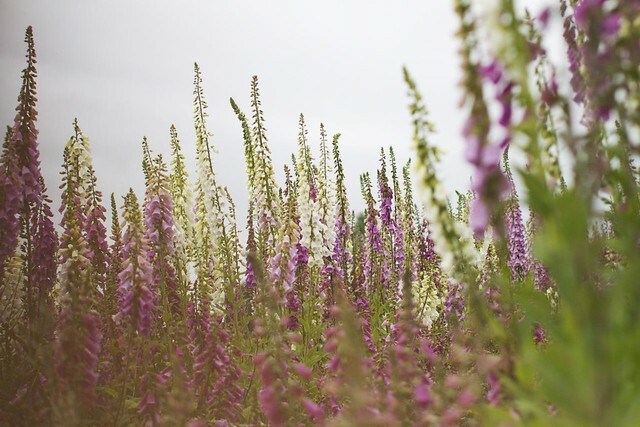 Taller than me, thousands of foxglove blowing in the breeze. Indifferent to the world around them, simply doing their thing, following their code. I don't like to romanticize too much, but it is an awe inspiring to witness such mystery. Pay attention flower lovers; Erin and Chris are revolutionizing the cut flower industry. I look forward to watching your flower farm grow. I sense that your eyes are wide open about the amount of work ahead, but I'm so glad you got to go to Floret Flower Farm for inspiration. I miss the PNW so much! Your post is dreamy and powerful. The two of you together in one room? Now, that's magical. I visit both of your blogs each morning to start my day off with a healthy dose of gorgeousness. Erin's farm seems amazing--and your arrangement of her flowers was stunning. Just think--soon, you, too, will be walking outside your door to fields full of fabulous blooms, just awaiting your magic touch. Cheers to you on your adventure! Oooooh. So much beauty that it's hard to convey in human language. You lucky girl; getting to see it in person. meant to be. lucky, you two. and so generous. 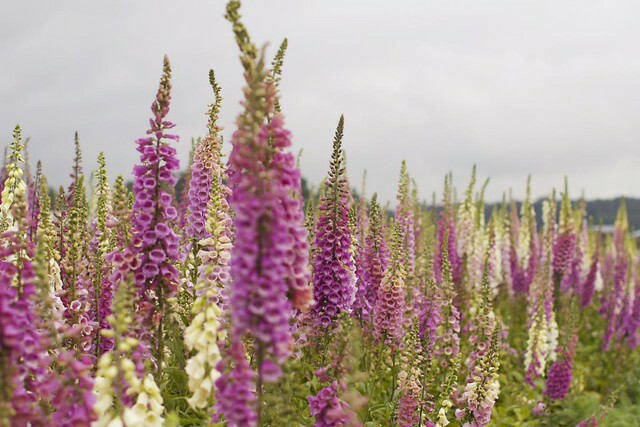 AND i want that foxglove !!!!! This seems to be a great site which offers Flowers Dubai, Flower Dubai, Flowers in Dubai, Flowers to Dubai, Send Flowers Dubai, Send Flowers online Dubai, Flowers delivery Dubai, Flowers delivery in Dubai and Flower Delivery Dubai...i had been relying on Flowersdubai.ae.com earlier and they offered good stuff. Holy sheeee-it will you look at those flowers! Sheer amazement. Oh wow. How I would love to visit Floret: her blog, and yours bring me the greatest joy and inspiration. Erin's flowers are amazing. We need someone with her creative vision and energy growing cut flowers in the UK. Thanks for your lovely post. You are both inspiring in your works. Always good to close the gap.